Neural crest cells are a temporary group of cells unique to vertebrates that arise from the embryonic ectoderm cell layer, and in turn give rise to a diverse cell lineage—including melanocytes, craniofacial cartilage and bone, smooth muscle, peripheral and enteric neurons and glia. Neural crest was first described in the chick embryo by Wilhelm His in 1868 as "the cord in between" (Zwischenstrang) because of its origin between the neural plate and non-neural ectoderm. He named the tissue ganglionic crest since its final destination was each lateral side of the neural tube where it differentiated into spinal ganglia. During the first half of the 20th century the majority of research on neural crest was done using amphibian embryos which was reviewed by Hörstadius (1950) in a well known monograph. However, considering the neural crest a vertebrate innovation does not mean that it was created de novo. Instead, new structures often arise through modification of existing developmental regulatory programs. For example, regulatory programs may be changed by the co-option of new upstream regulators or by the employment of new downstream gene targets, thus placing existing networks in a novel context. This idea is supported by in situ hybridization data that shows the conservation of the neural plate border specifiers in protochordates, which suggest that part of the neural crest precursor network was present in a common ancestor to the chordates. In some non-vertebrate chordates such as tunicates a lineage of cells (melanocytes) has been identified, which are similar to neural crest cells in vertebrates. This implies that a rudimentary neural crest existed in a common ancestor of vertebrates and tunicates. Endocrine cells: chromaffin cells of the adrenal medulla, parafollicular cells of the thyroid, glomus cells type I/II. Peripheral nervous system: Sensory neurons and glia of the dorsal root ganglia, cephalic ganglia (VII and in part, V, IX, and X), Rohon-Beard cells, some Merkel cells in the whisker, Satellite glial cells of all autonomic and sensory ganglia, Schwann cells of all peripheral nerves. 1 2 3 4 5 6 Huang, X.; Saint-Jeannet, J.P. (2004). "Induction of the neural crest and the opportunities of life on the edge". Dev. Biol. 275: 1–11. doi:10.1016/j.ydbio.2004.07.033. 1 2 3 4 5 Meulemans, D.; Bronner-Fraser, M. (2004). "Gene-regulatory interactions in neural crest evolution and development". Dev Cell. 7: 291–9. doi:10.1016/j.devcel.2004.08.007. 1 2 Sauka-Spengler, T.; Meulemans, D.; Jones, M.; Bronner-Fraser, M. (2007). "Ancient evolutionary origin of the neural crest gene regulatory network". Dev Cell. 13: 405–20. doi:10.1016/j.devcel.2007.08.005. PMID 17765683. 1 2 Le Douarin, N.M. (2004). "The avian embryo as a model to study the development of the neural crest: a long and still ongoing story". Mech Dev. 121: 1089–102. doi:10.1016/j.mod.2004.06.003. ↑ Hörstadius, S. (1950). The Neural Crest: Its Properties and Derivatives in the Light of Experimental Research. Oxford University Press, London, 111 p.
↑ Le Douarin, N.M. (1969). "Particularités du noyau interphasique chez la Caille japonaise (Coturnix coturnix japonica). Utilisation de ces particularités comme "marquage biologique" dans les recherches sur les interactions tissulaires et les migrations cellulaires au cours de l'ontogenèse"". Bull biol Fr Belg. 103: 435–52. ↑ Le Douarin, N.M. (1973). "A biological cell labeling technique and its use in experimental embryology". Dev Biol. 30: 217–22. doi:10.1016/0012-1606(73)90061-4. ↑ Vallin, J.; et al. (2001). "Cloning and characterization of the three Xenopus slug promoters reveal direct regulation by Lef/beta-catenin signaling". J Biol Chem. 276: 30350–8. doi:10.1074/jbc.M103167200. ↑ Mayor, R.; Guerrero, N.; Martinez, C. (1997). "Role of FGF and noggin in neural crest induction". Dev Biol. 189: 1–12. doi:10.1006/dbio.1997.8634. ↑ Tribulo, C.; et al. (2003). "Regulation of Msx genes by Bmp gradient is essential for neural crest specification". Development. 130: 6441–52. doi:10.1242/dev.00878. ↑ Dottori, M.; Gross, M.K. ; Labosky, P.; Goulding, M. (2001). "The winged-helix transcription factor Foxd3 suppresses interneuron differentiation and promotes neural crest cell fate". Development. 128: 4127–4138. ↑ Vincentz, J.W. ; et al. (2008). "An absence of Twist1 results in aberrant cardiac neural crest morphogenesis". Dev Biol. 320: 131–9. doi:10.1016/j.ydbio.2008.04.037. ↑ Light, W.; et al. (2005). "Xenopus Id3 is required downstream of Myc for the formation of multipotent neural crest progenitor cells". Development. 132: 1831–41. doi:10.1242/dev.01734. ↑ Taneyhill, L.A. (2008). "To adhere or not to adhere: the role of Cadherins in neural crest development". Cell Adh Migr. 2, 223–30. ↑ Gans, C.; Northcutt, R. G. (1983). "Neural crest and the origin of vertebrates: A new head". Science. 220: 268–274. doi:10.1126/science.220.4594.268. ↑ Sauka-Spengler, T.; Bronner-Fraser, M. (2006). 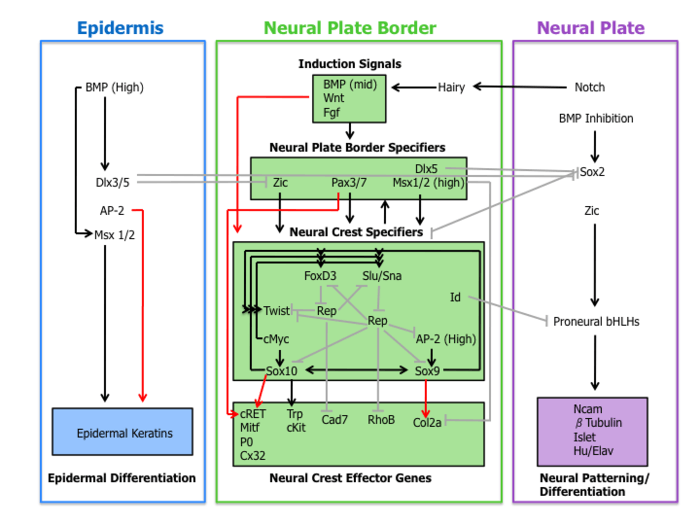 "Development and evolution of the migratory neural crest: a gene regulatory perspective". Curr Opin Genet Dev. 13: 360–6. doi:10.1016/j.gde.2006.06.006. ↑ Donoghue, P.C. ; Graham, A.; Kelsh, R.N. (2008). "The origin and evolution of the neural crest". BioEssays. 30: 530–41. doi:10.1002/bies.20767. ↑ Abitua, P. B.; Wagner, E.; Navarrete, I. A.; Levine, M. (2012). "Identification of a rudimentary neural crest in a non-vertebrate chordate". Nature. 492: 104–107. doi:10.1038/nature11589. ↑ Kalcheim, C. and Le Douarin, N. M. (1998). The Neural Crest (2nd ed.). Cambridge, U. K.: Cambridge University Press. ↑ Van Keymeulen, A; Mascre, G; Youseff, KK; et al. (October 2009). "Epidermal progenitors give rise to Merkel cells during embryonic development and adult homeostasis". J. Cell Biol. 187: 91–100. doi:10.1083/jcb.200907080. PMC 2762088 . PMID 19786578. ↑ Szeder, V; Grim, M; Halata, Z; Sieber-Blum, M (January 2003). "Neural crest origin of mammalian Merkel cells". Dev. Biol. 253: 258–63. doi:10.1016/s0012-1606(02)00015-5. PMID 12645929.